Green Island is near the town of Brooklin, Maine, west of Mount Desert Island, at the western edge of Blue Hill Bay. The low-lying island is about three-quarters of an acre at high tide and about three times that size at low tide. The island is one of a group of four islands called the Fly, or Flye, Islands after an early owner. In the mid-nineteenth century, the town of Ellsworth, on the Union River north of Blue Hill Bay, was a thriving lumber port, and a lighthouse was needed to guide mariners into the southern entrance to the bay. 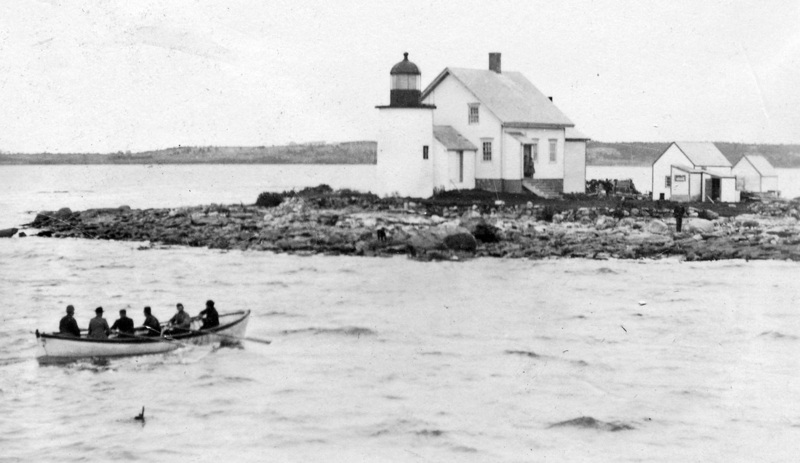 Abraham Flye sold Green Island to the federal government for a light station in 1855 for $150, and the light was established on the west side of the island in 1857. The lighthouse also helped guide mariners into the eastern end of Eggemoggin Reach, which connects Penobscot Bay with Blue Hill Bay. ​The lighthouse was often called Eggemoggin Light. A fourth-order Fresnel lens was installed in the tower, exhibiting a fixed white light. Late 1800s. Courtesy of Dolly Bicknell. Beginning in 1900, a fog bell in a bell towerwith automatic striking machinery was in operation. The lighthouse was connected by a brick passageway to a wood-frame 1 1/2-story Colonial Cape keeper's house. A barn, boathouse, and outhouse were also built; an oil house was added in 1905. A 1050-gallon cistern collected rainwater in the basement of the house, providing fresh water for the keeper and his family. In the 1890s, the five children of Keeper Roscoe Lopaus were schooled by a teacher who boarded on the island. Keepers at the station augmented their food supplies by fishing and hunting in the area. On a summer camping trip in the 1920s, Keeper Roscoe Chandler and his family caught almost 300 pounds of cod, hake and cusk nearby. Duck and lobster were also staples. Chandler also owned a farm in Monroe, Maine. Two of his children, Catherine and Everett, lived at the farm while attending high school in Monroe. In their early teens, they obtained a cow and walked her from Monroe all the way to the light station. Along the way, they stopped at a farm each day and swapped the cow's milk for lodging and a meal. Left: Roscoe Chandler and his wife Mary at their 50th wedding anniversary in 1961. Courtesy of Joseph G. Kelley. Eventually, two cows were pastured on Flye Island to provide milk for the Chandlers. According to his grandson, Joseph G. Kelley, the cows were particularly important because Keeper Chandler had ulcers and needed a good supply of milk. Lacking a telephone, the families at Green Island devised unique modes of communication. In the 1920s, when Keeper Chandler was needed on shore, a woman across on the mainland would hang a black suit outside her house as a signal. The lighthouse was discontinued in 1933. It was replaced by an automatic light on a skeleton tower. The automatic light, now solar powered, remains in use. In 1976, Blue Hill Bay Lighthouse was purchased by Wilbur and Edith Trapp of New Jersey. The Trapps had the house and other buildings (even the outhouse is still standing) beautifully restored. More recently, the property was bought by Jim and Alice Ann Madix. The property was sold again in October 2017 for $460,000. From the keeper's house on Green Island there is a spectacular 360-degree view of Blue Hill Bay, Mount Desert Island, Eggemoggin Reach, and Deer Isle. The best views of Blue Hill Bay Light are from the water. The Maine Environmental Research Institute offers a variety of cruises from Town Dock on Naskeag Point in Brooklin. All the cruises sometimes pass the lighthouse, and the Ecocruise almost always does.